Are you fascinated by wolves? Are you also a little frightened of them? For thousands of years, humans have loved, feared and even hated wolves. By learning more about them, we can learn to appreciate them, rather than fear them. 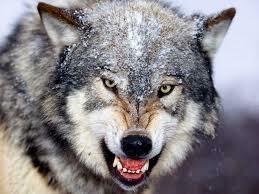 Alpha wolf is the leader of a group or family. Read on for more all about wolves. Wolves are actually a lot like humans. They live in close families, or packs, their whole lives. A pack has a female and male leader. These two wolves are called the “alphas.” The alphas are the only ones that have babies. They keep order, direct hunting trips and solve fights. Does that sound like your parents? The other wolves living in the pack are their children. Even the grown children stay with the parents and follow the rules. All About Wolves: All wolves howl. Wolves love to play, but you probably wouldn’t want to join their antics. They knock each other down and nip and bite each other – sort of like wrestling with your Dad, but a lot rougher. All the wolves in a pack help take care of the pups. Cubs bond with their families when they are babies. 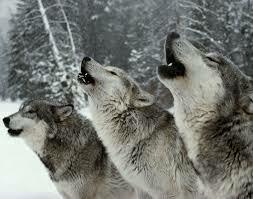 All wolves howl. We’re not sure exactly why they howl, but scientists think wolves howl to scare other wolves away or to communicate within their pack. Wolves are carnivores. They eat everything from deer and moose to rabbits and mice. They work in teams to hunt large animals. Wolves live in many parts of the world. Gray wolves, Eastern wolves and red wolves live in the United States. Wolves are carnivores. They eat everything from deer and moose to rabbits and mice. A video documentary about the truth of the lives of wild wolves and their pack. Question 1: Are wolves endangered? Answer 1: Wolves were hunted and killed almost to the point of extinction in the United States. In fact, the red wolf was extinct, except for a few that lived in reserves. Today, wolves are returning to forests and mountain areas in the U.S. Question 2: Are wolves bigger than dogs? Answer 2: That depends on the dog, but wolves are as big, or bigger than most dogs. Male wolves weigh between 70 and 110 pounds. Question 3: Do wolves hunt together? Answer 3: Yes wolves hunt in groups called packed. A pack of wolves. The pack is generally made up of Mom and Dad and some kids (pups). Question 4: Do wolves go into hibernation? Question 5: How much meat does a Gray wolf eat? Answer 5: The gray wolf will need to eat at least 2.5 pounds of meat to survive and at least 7 pounds to enable them to reproduce pubs. 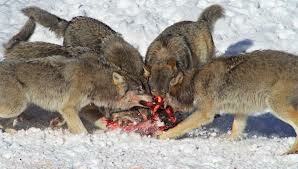 Wolves can go days without food so when prey comes along they will devour what they can. A large grey wolf can eat up to 22 pounds during one meal. Question 6: How many different species of wolves are there in North America? Answer 6: There are two different species of wolves in North American – The Gray Wolf and the Red Wolf. Question 7: Is the gray wolf bigger than the red wolf? Answer 7: Yes the gray wolf is the bigger of the two. Question 7: How fast can a wolf run? Answer 7: Wolves are very fast over short distances, they can run at a whopping 35 mph. A wolf can travel long distances, up to 50 miles in a day, but when doing so they average about 5 mph. Question 8: How many pubs can a wolf have in one litter? Answer 8: Generally 4 to 6 pubs in a litter. Question 9: How often do wolves breed? Answer 9: Wolves only breed once per year between the months January and March. Question 10: How long do wolves live in the wild? Answer 10: A wolf in the wild can live on average 8 – 10 years but a wolf has a very difficult life from the very start. They have to survive harsh winters, starvation, and unfortunately hunters. Enjoyed the Easy Science for Kids Website all about Wolves info? Take the FREE & fun Wolves quiz and download FREE Wolves worksheet for kids. For lengthy info click here. Declan, Tobin. " Wolf Fun Facts for Kids ." Easy Science for Kids, Apr 2019. Web. 21 Apr 2019. < https://easyscienceforkids.com/all-about-wolves/ >.